Rich tailors his plan to each individual, guaranteeing carefully calculated results for each athlete. No matter your skill, he will work with you. He answered all my hundreds of questions, which helped me to better understand the journey and do all my workouts to the best of my ability. He's affordable and effective - I highly recommend him. I used to think "my body wasn't made to go fast. "Since training for triathlons and running events with Richard Wygand since February and following his suggested high fat/low carb diet since May, I now realize that I am in control of how my body feels, looks and performs. I finished my first olympic triathlon 6th overall female and first in my age group and felt really confident in my abilities during the race. I finished a 5k on a hot summer night in Key West in 23:44 which was 2 full minutes off of my previous PR.I used to ache in the legs/knees after a long run (more than 10 miles) and dread walking down the stairs. I needed a nap and ice. Now I am ready to embrace the day even though I know I should still rest. I wake up with more energy than ever before. My boyfriend has even said, "How are you not sore?" after we ran the same distance and he is hurting. I feel like this experience has given me greater confidence in all aspects of my life, mostly learning to live in the moment and embrace my relationship with myself. RW works because it is so personalized and the other athletes and coaches are very supportive and the best people you could ever meet. and personal life allows and work on your strengths and weaknesses..
from triathlon books, websites, friends and whatever I could put my hands on ... or just common sense (which in reality means the exact opposite). This is a brief summary of my first IM and the positive impact that Rich Wygand had in my training, preparation and race. July-27-2016: Decided to sign up for the TEXAS IRONMAN! Yeyyyyyy! OMG what I have done?!!! Aug-07-2016: My friend convinced me to also sign-up to run the Houston Marathon on January-17-2017, because I have never ran a marathon until that point. Aug-15-2016: Running has been my weakest sport, so I decided to focus ONLY on running. Race the marathon in January, then train Bike and Swin after the marathon. to the Marathon distance by race day. floor and ate ice cream for the next hour or so. Could not move and my legs were shot! I was walking like a duck for about a week. At that point I realized I was NOT READY for the Ironman race. Jan-17-2017: YES, the same day I did the marathon ... I called for HEEEELLLPPPPPP!! Rich Wygand, who I know for many years and hired him on the spot as my coach for the Ironman. 95 Days to GO! No time to waste!! Well ... I also need a few weeks to recover from the marathon, so it was a tied schedule and Rich had to pull a miracle in two and a half months to go. I followed the training diligently and maybe missed only a few days of workout due to travel/family events. Rich was instrumental in coaching me on everything ... nutrition, race preparation, race strategy, bike gear, swim gear, stretching .. he even fixed the hip pain I had for several months go away. I did my first 70.3 race in 2008, and here I am ... 43 years old and I am in the BEST SHAPE OF MY LIFE!! Ready to race an a full IRONMAN distance. On race day I followed the strategy exactly as Rich told me. Swim, T1, Bike, T2 and Run ... the results were incredible!! FINISH TIME: 11:42: 45 !!! WHATTT?!!! I could not believe it! And the most amazing thing about the race, was my marathon time, 4:04:32 !! That is 6:34 faster than my Houston Marathon time alone ! Not a single cramp during the entire race and only stopped when I crossed the finish line !! Rich, thank you for helping me check this HUGE Bucket list item that I've been thinking about (and postponing) for the last 10 years!!! On June 16th, 2011 my entry was accepted into the inaugural IRONMAN NEW YORK. The very idea of me training and taking on the quest of becoming an IRONMAN had me both excited and nervous. I never thought it was possible for me to be able to swim 2.4 miles, bike 112 miles and then run a 26.2 mile marathon. Two days later while shopping at Whole Foods, I saw Richard in the checkout lane. I ran with Richard a few times socially, and I was aware of his work ethic and commitment as an up-and-comer in the IRONMAN coaching and competing world. Right on the spot I asked him to train me and paid him for the first month. I wanted Richard to know that I was serious about this undertaking. Richard delivered. I followed his instructions precisely for the next 14 months. The training was beyond anything I’d ever undertaken. Richard guided and listened to me each and every day. His coaching was exemplary. On August 11th, 2012 I officially became and IRONMAN. I met Richard eight years ago when the Wellington triathlon was initially formed. I had been doing triathlons of all distances for a couple of years but had no idea how to start to train for a full distance triathlon. I started training with Richard and I have now completed 5 Ironman triathlons! Two Ironmans before cancer and three after. I mention this because Richard has tailored all my training depending on my mental and physical situation and I have felt stronger each time. I can truly say that Richard tailors each training plan for the individual athlete. 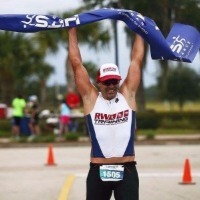 From Strength work, swimming, biking, running and nutrition Richard covers it all. During my last Ironman I followed his race nutrition plan exactly by using Vespa and gels. Finally! No bonking or stomach upset. RW training will get you to the finish line healthy and strong! I prefer to refer to Coach Richard as my “life coach” not just my triathlon coach. The main reason I feel this way is because of his belief in me both as a triathlete and non-triathlete. I have never met someone who encouraged and believed in me not only when training but in personal goals and endeavors. He truly believes that training goals are reached when you are able to find balance and happiness in all aspects of life. He strives to help you realize your potential by providing you with healthy lifestyle changes and habits essential for balance and happiness. He is a good/selfess person, knowledgeable, flexible, easy to talk to and very responsive. Anyone who works with Coach Richard is left a better person because of it! I know I have found more balance and inner-happiness because of the guidance I'm given under Coach Richard and I will be forever thankful.